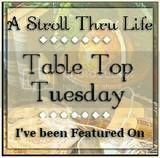 Before I begin this post, I would like to thank Ron, at the Uptown Acorn, for his blessing in allowing me to almost copy a similar post on his blog recently! Thank you, Ron! 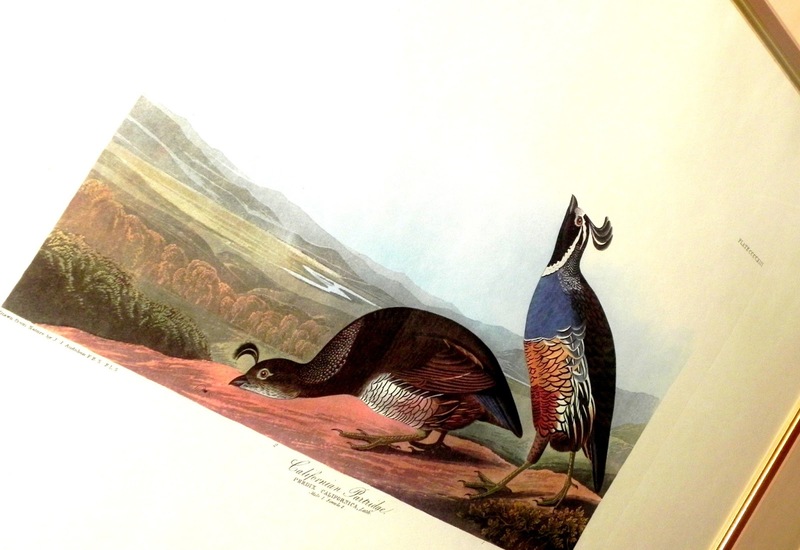 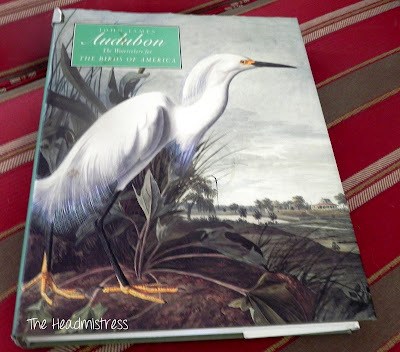 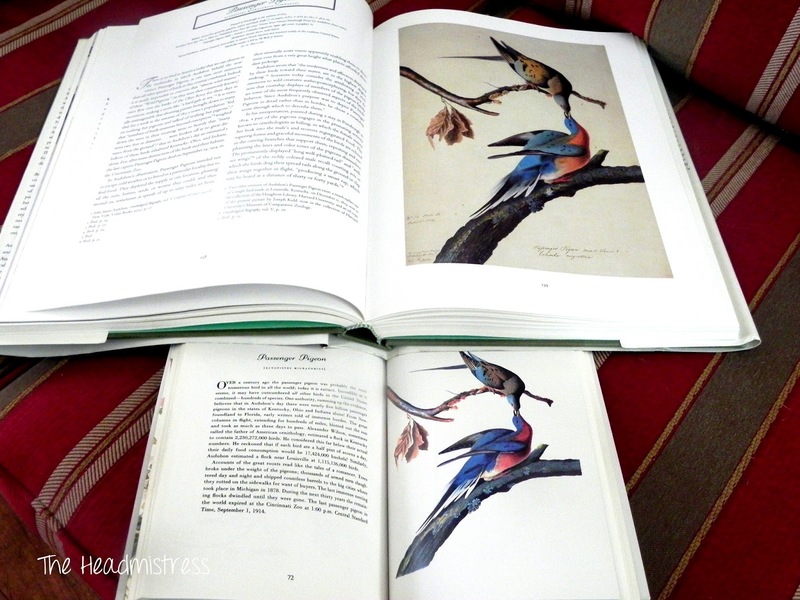 Most of you will, no doubt, be familiar with John James Audubon who was and is known world wide for his fabulous drawings and etchings of the fabulous Birds of America. 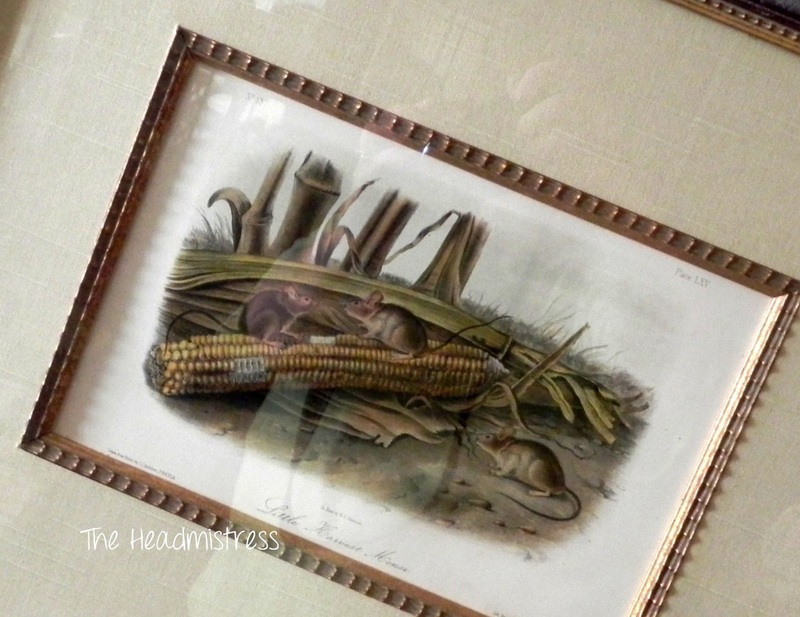 He spent some time north of us in St. Francisville, LA, which he lovingly called "Happyland." 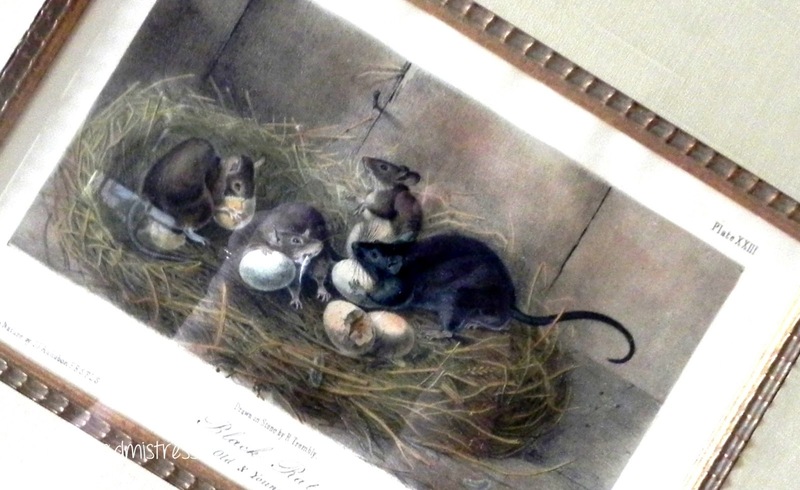 He produced a number of drawings there while serving as a tutor to the daughter of a very prosperous resident. 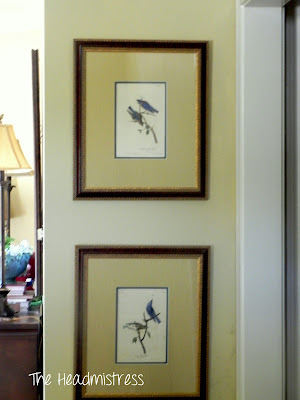 I have been enchanted by his work for a very long time, and have quite a few hanging in our home in Louisiana. Did you know that, in addition to his well known birds, Audubon also drew a variety of other animals found in North America? 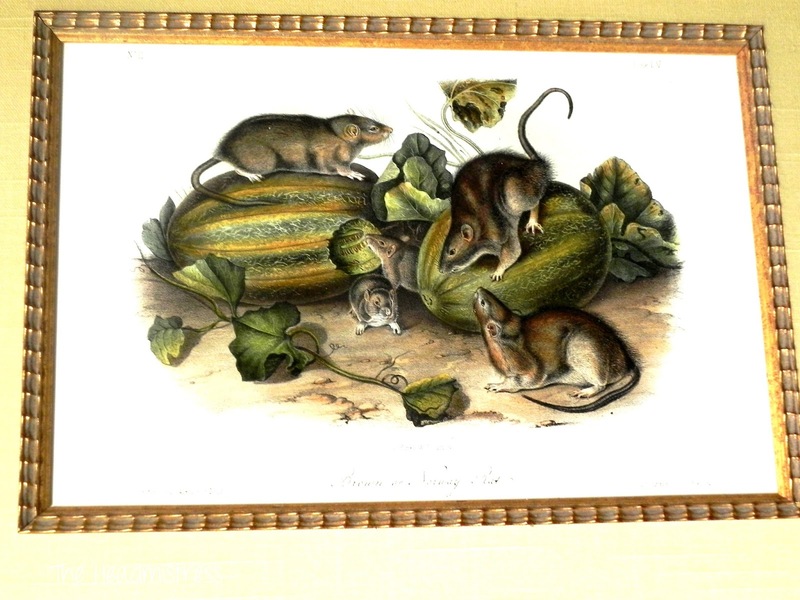 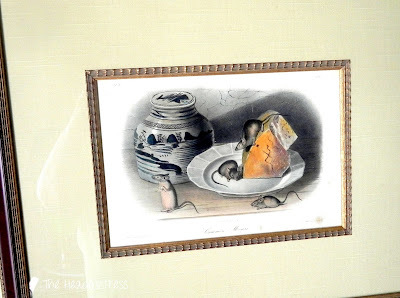 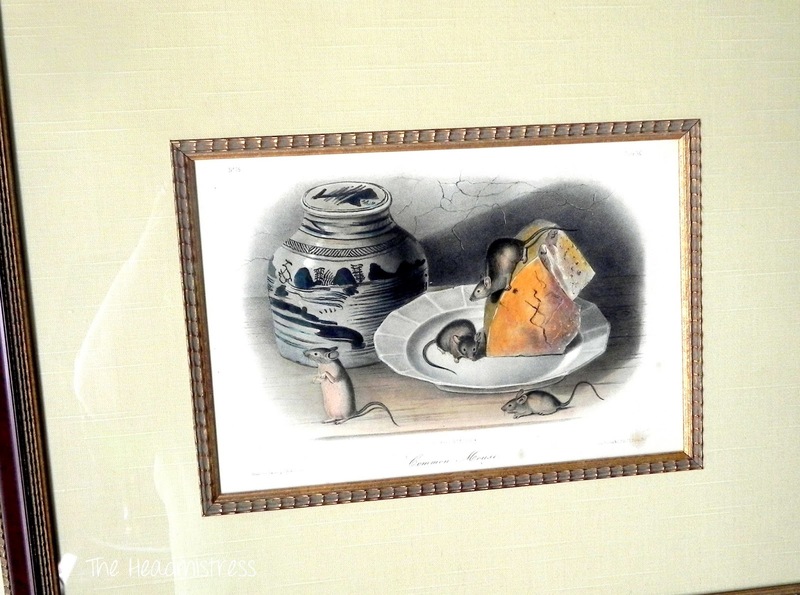 The picture above is of the common mouse with a block of cheese and a ginger jar. 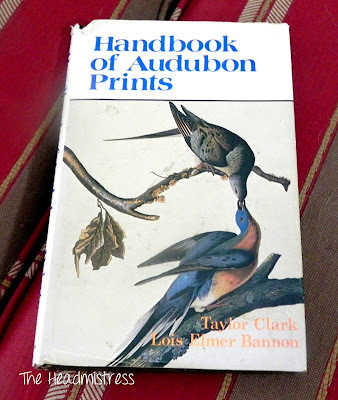 This is one of the few times that Audubon included an inanimate object. It's hard to find. 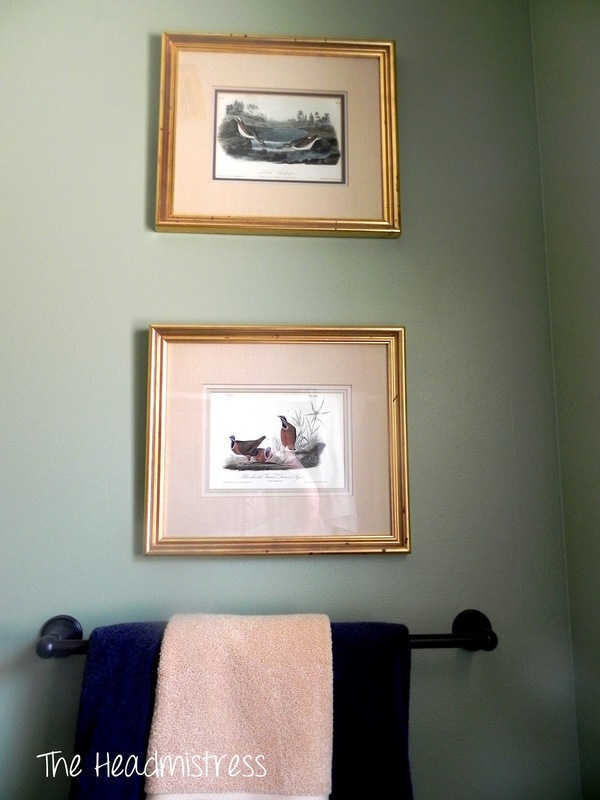 They're even in the bathroom! 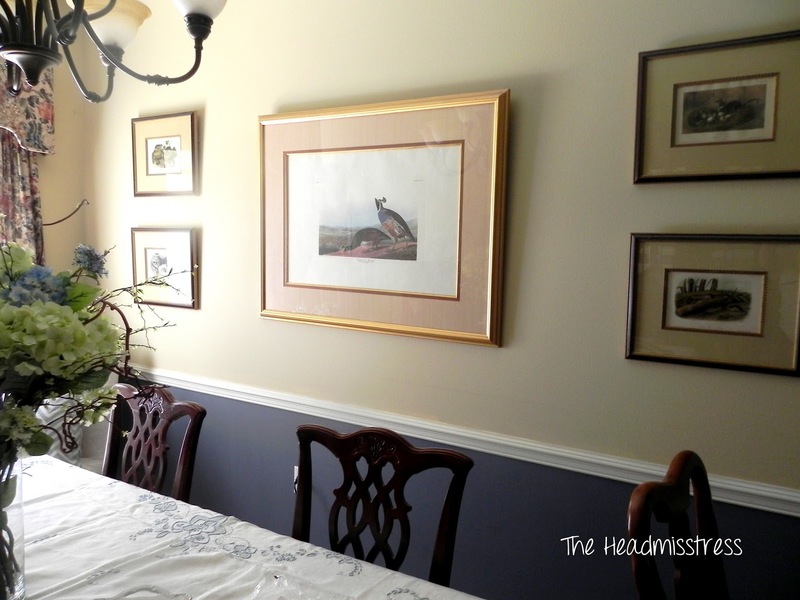 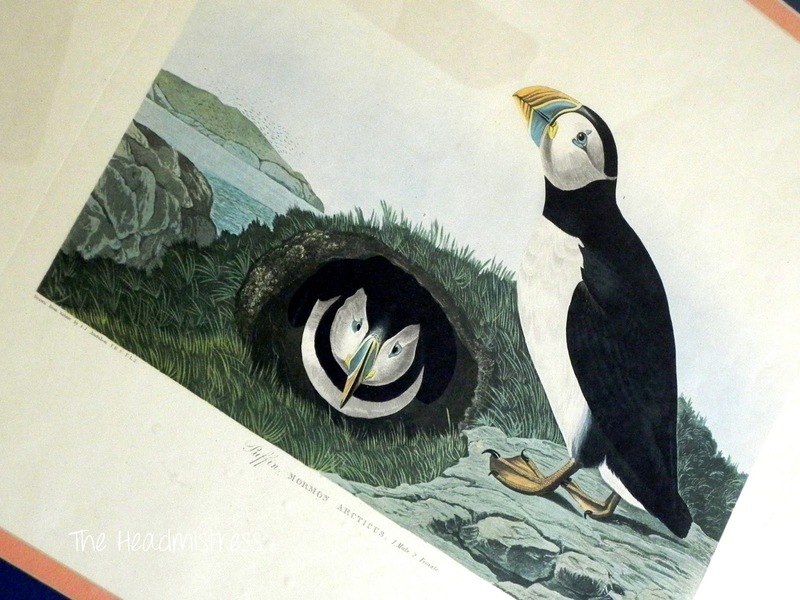 And I love the puffins, but they desperately need to be re-framed. Same bird (carrier pigeon); different book. 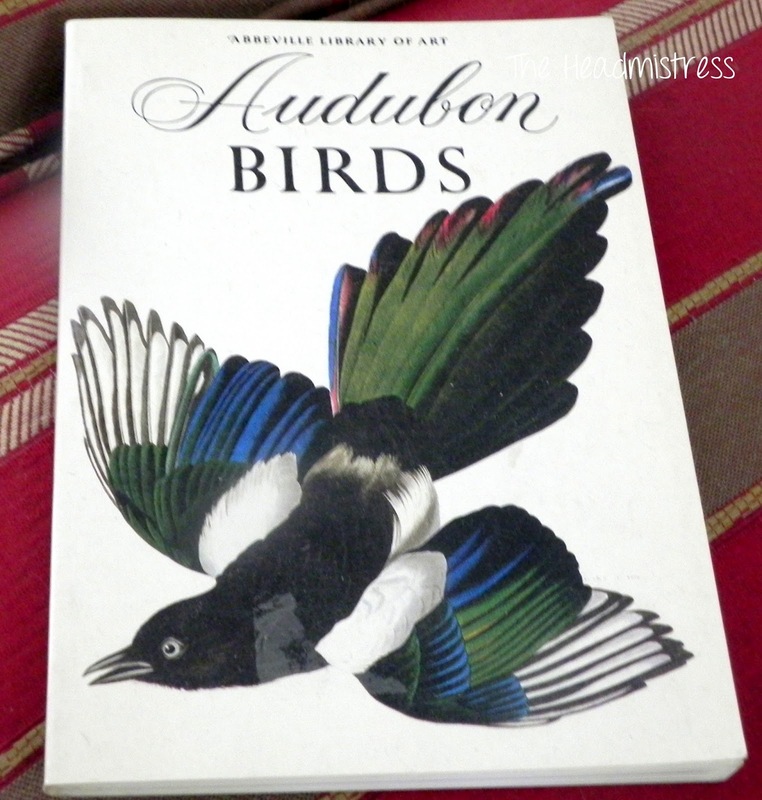 Many libraries and museums around the country have collections of these fabulous masterpieces. 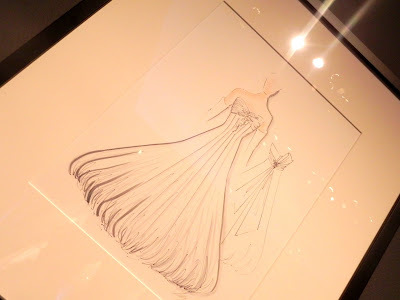 I hope you enjoyed seeing them! This is a follow up to the post last week on some of the gowns designed by New Orleanian Suzanne Perron. 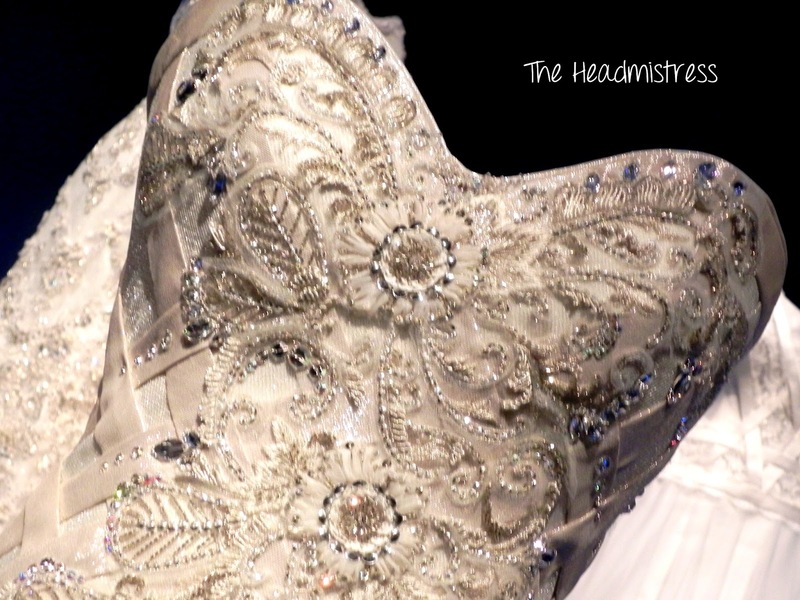 She is a wonderful dressmaker, artist, designer who designs very high end gowns for Carnival Queens and maids, debutantes, and brides. 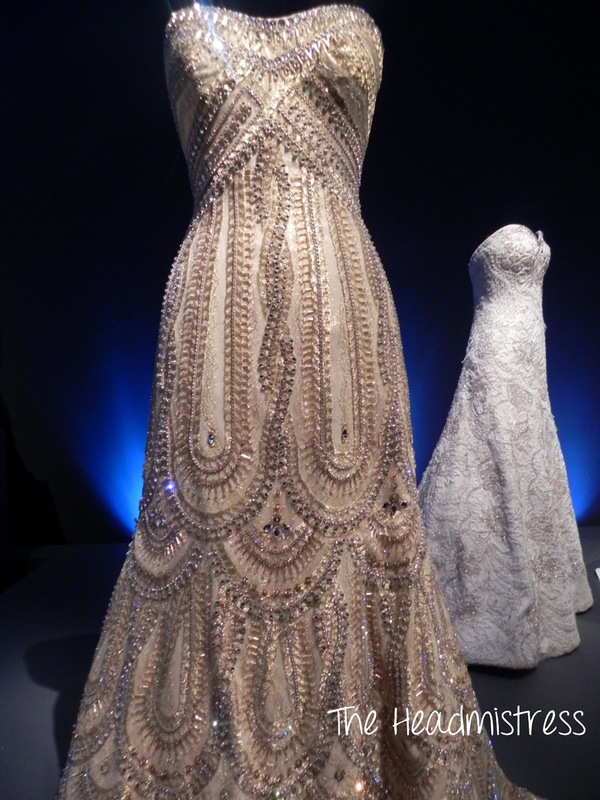 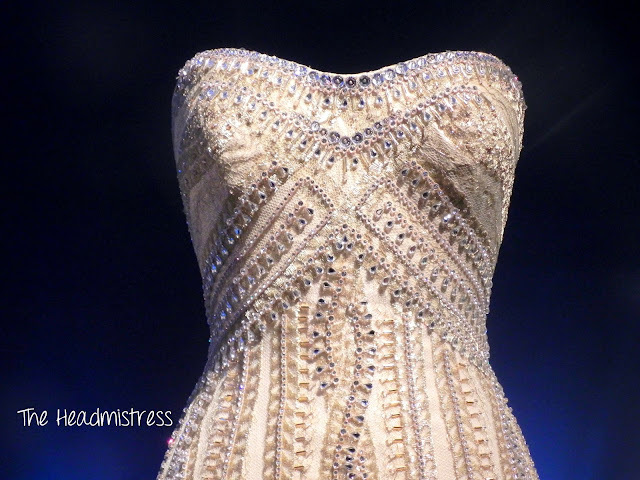 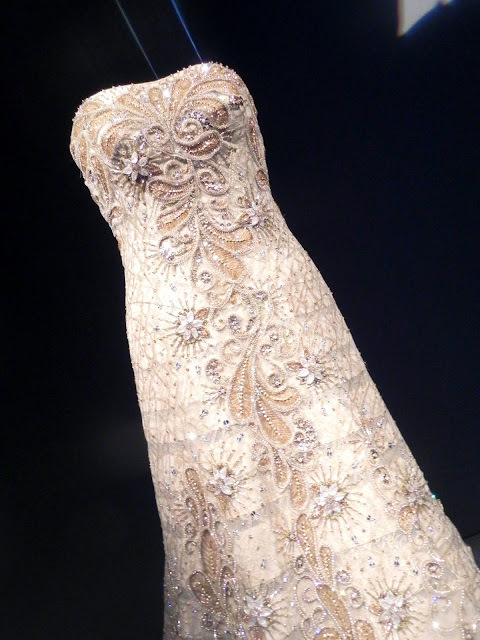 Currently there is an exhibition of a dozen plus a few of the gowns at the LSU Museum of Art in Baton Rouge. If you live in the area, this is something not to be missed! 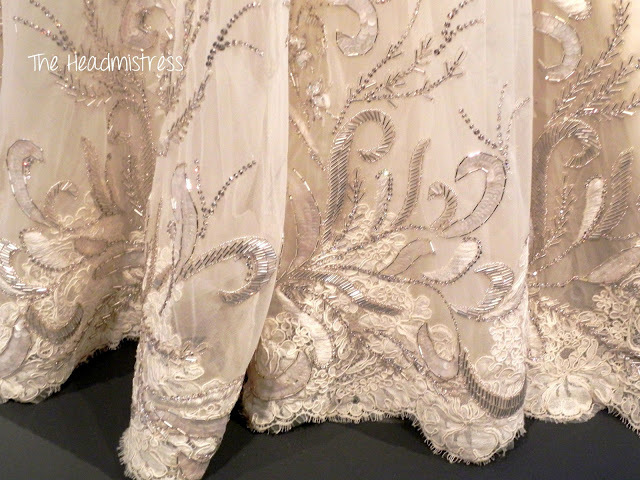 (While I was a little disappointed that the veils were not included, I have noticed that lately veils don't seem to be as prominent as they once were). 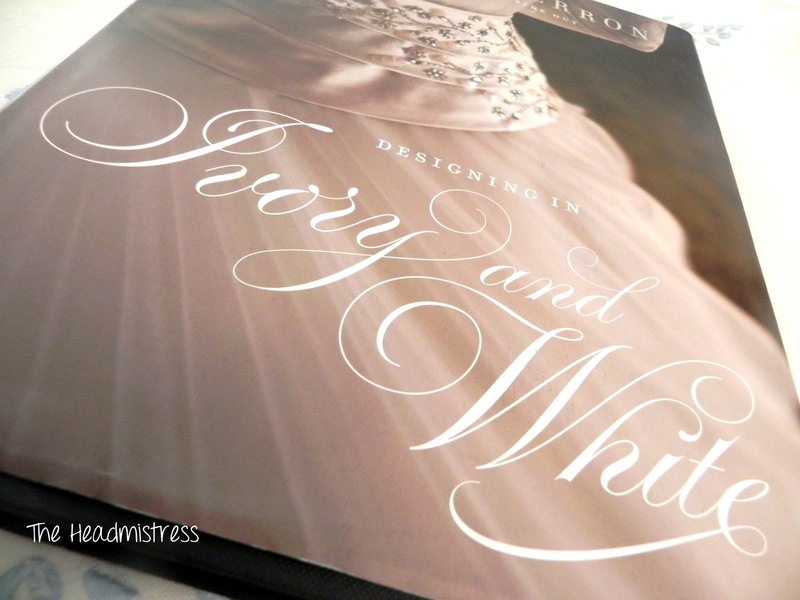 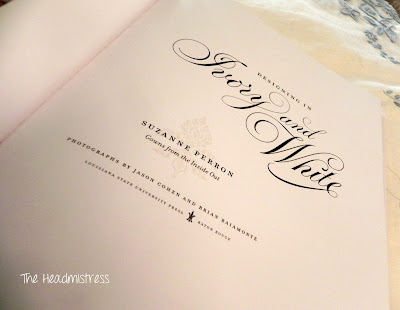 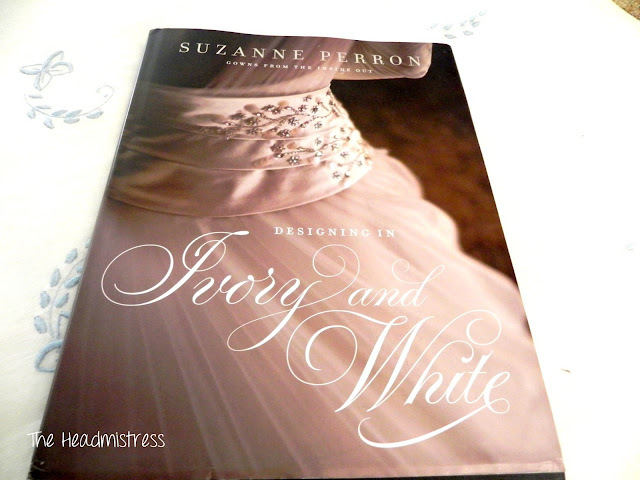 Her wonderful book, Designing in Ivory and White, takes a much closer look the construction of these gowns, and traces their development from sketch to muslin sample to the intricate handwork that provides the exquisite finish. It is a lovely, lovely book. Brides, Carnival queens, maids, and debutantes are featured. 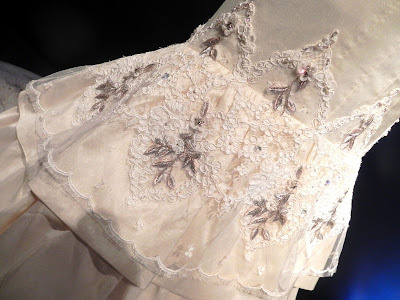 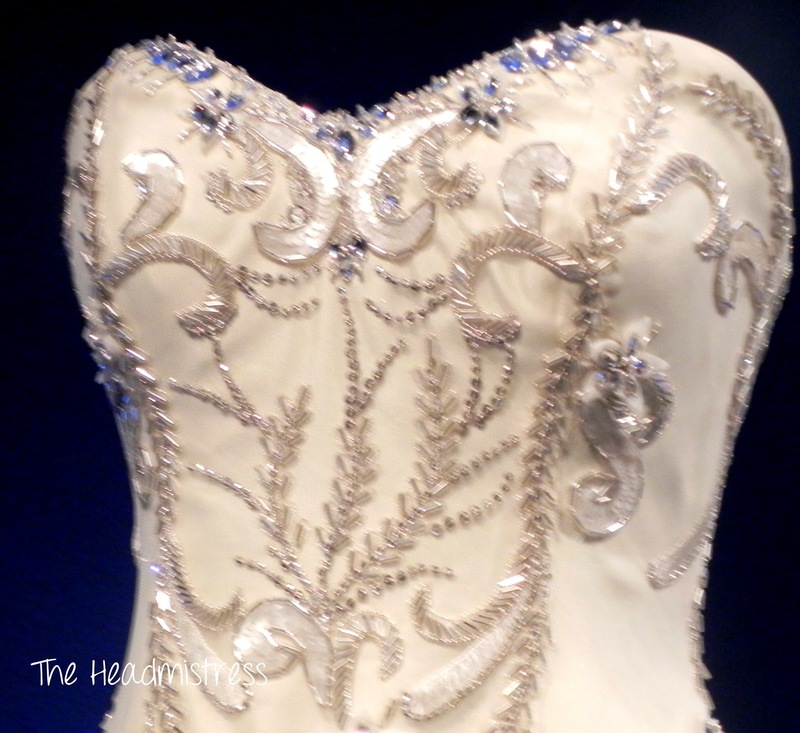 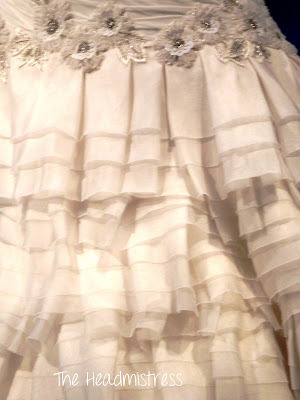 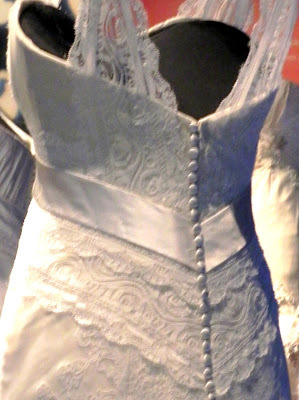 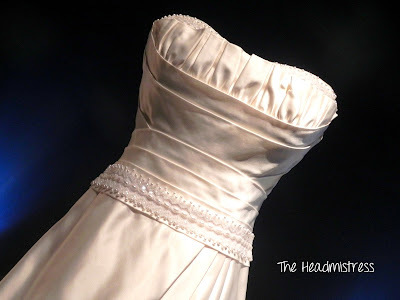 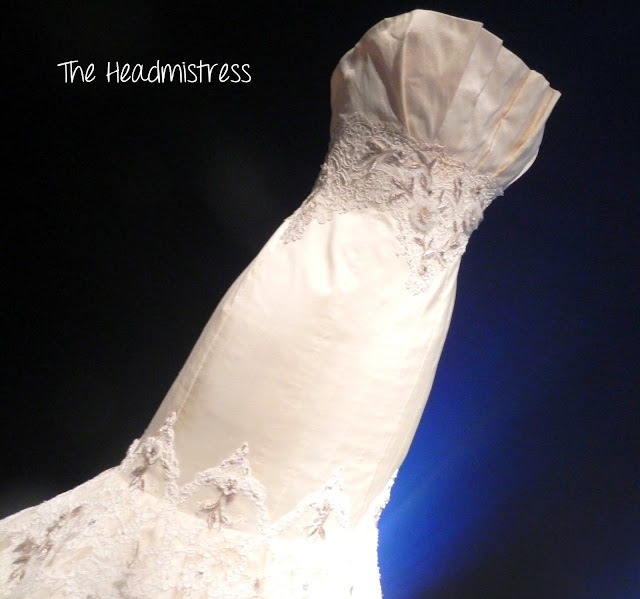 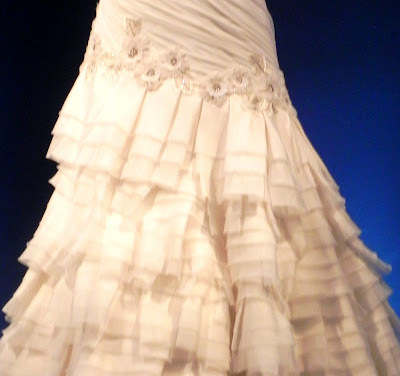 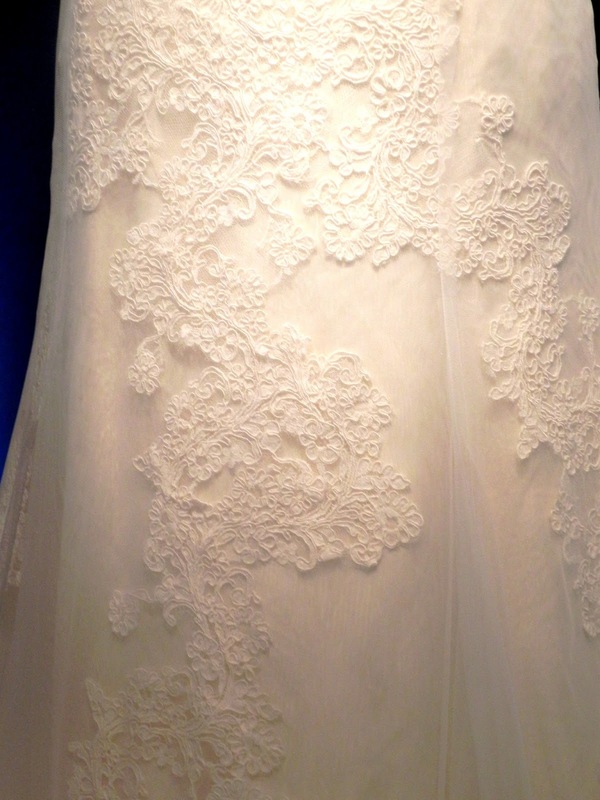 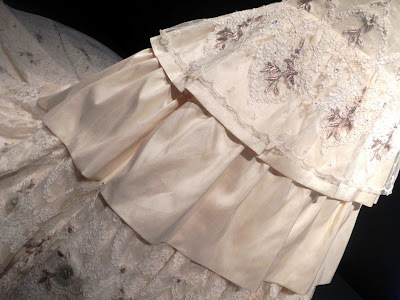 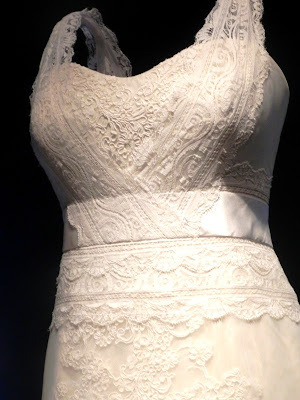 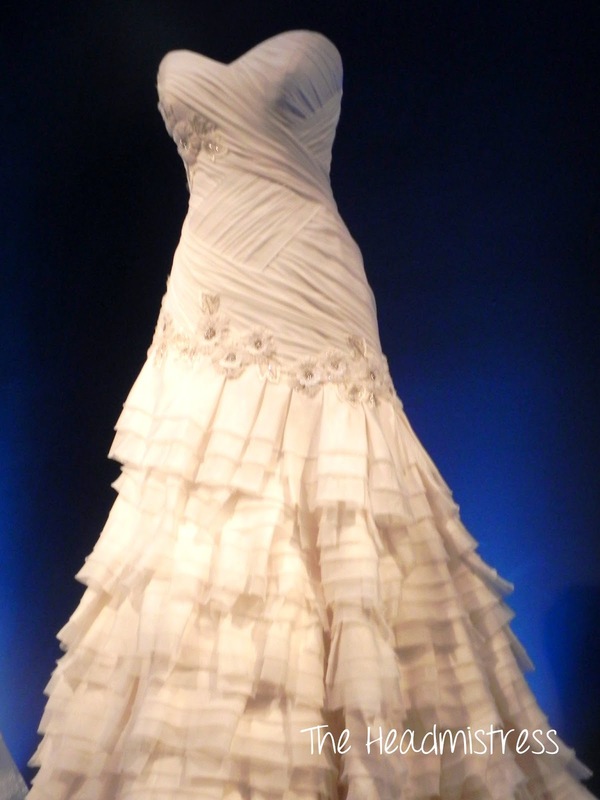 The LSU Museum exhibit has three of the wedding gowns on display. 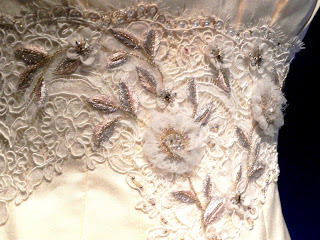 I tried to get as many pictures as I could, even from the back, as the beautiful work doesn't just stop in the front! 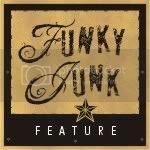 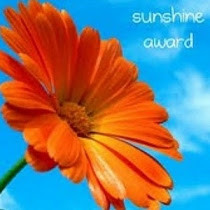 I hope you'll enjoy these! 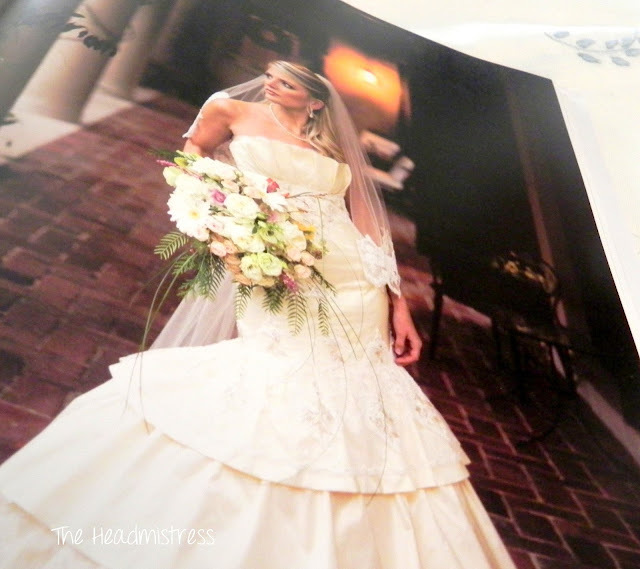 This is the actual bride in the gown, a picture from the book. This was a fabulous exhibit! Thank you so much for enjoying it with me! 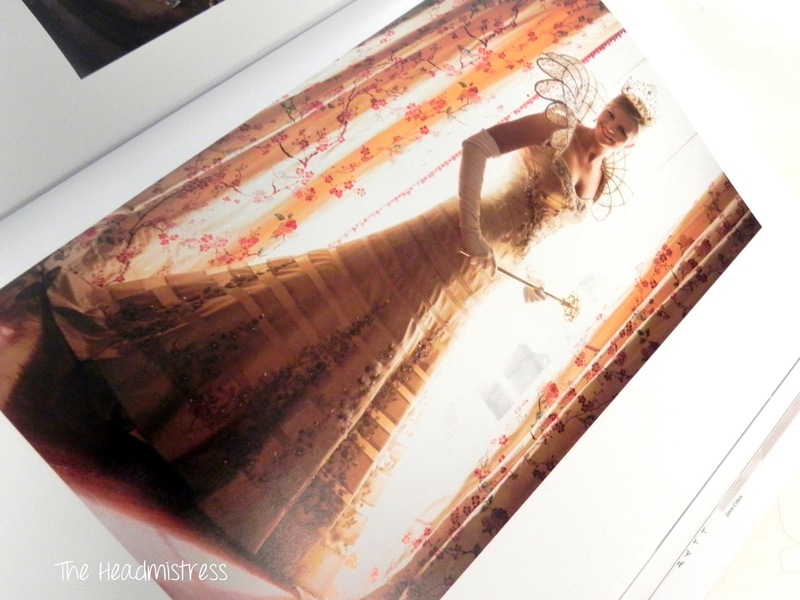 I don't know about you all, but I still love all things Queens and Princesses. 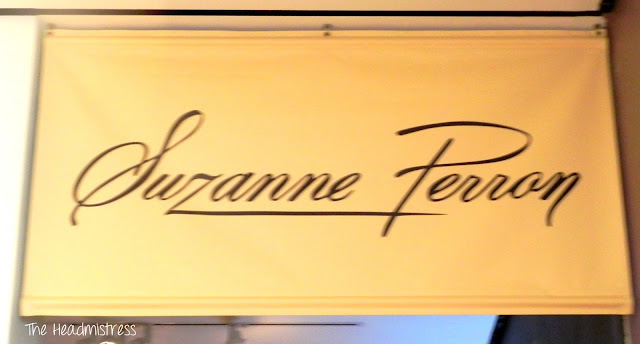 Today, I spent a good part of the afternoon at the LSU Museum of Art in complete wonderment over the Suzanne Perron exhibit. 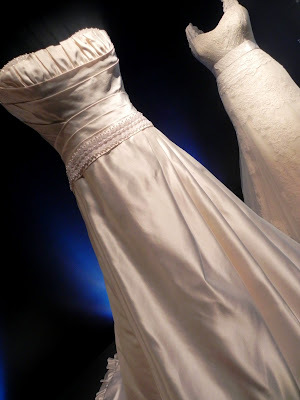 Ms. Perron is a dressmaker, artist, designer extraordinaire who lives in New Orleans and designs gowns for debutantes, carnival queens and maids, as well as wedding gowns. 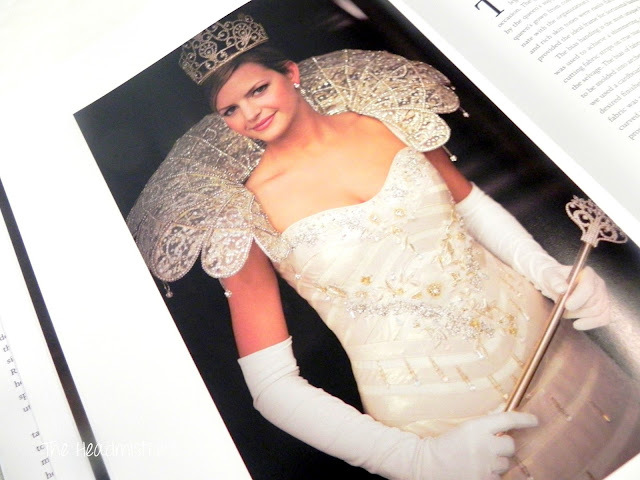 Since I have no access to the grand carnival balls in New Orleans, I have only seen some of these gowns in the pages of (what's left of) the New Orleans paper. 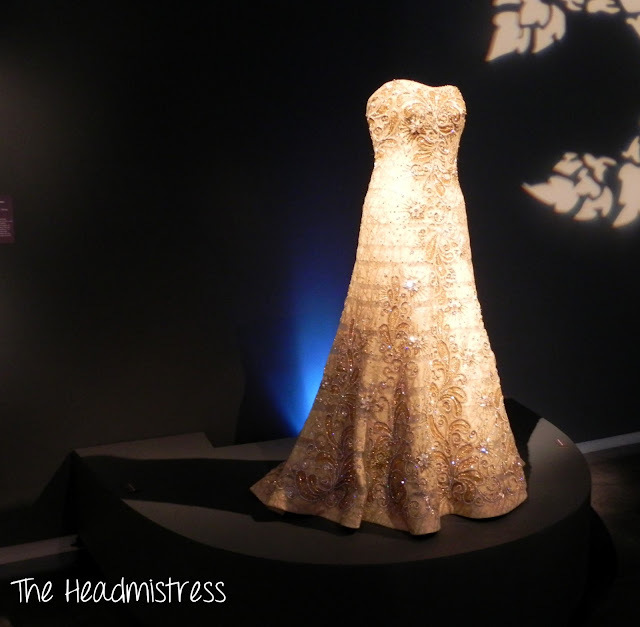 So, when this exhibit was announced, I knew I had to see it! 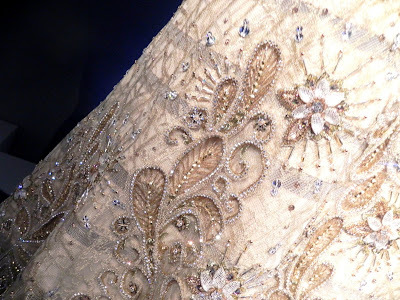 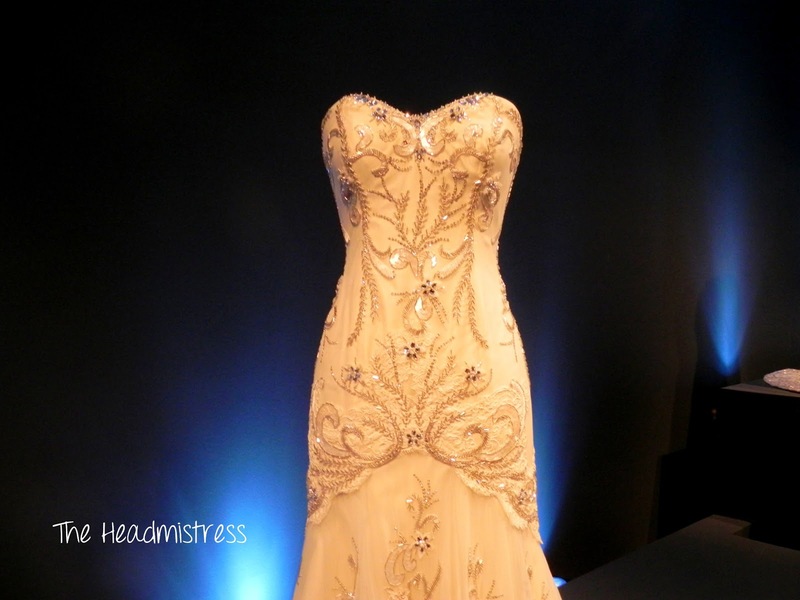 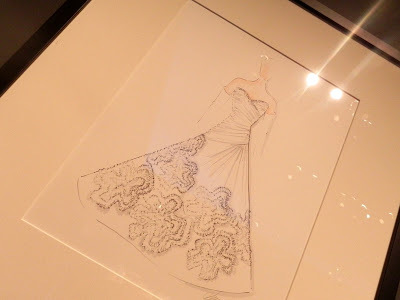 Preceding this exhibit, I purchased her book, Designing in Ivory and White, which gives a glimpse into the extraordinary work and detail that go into these gowns. 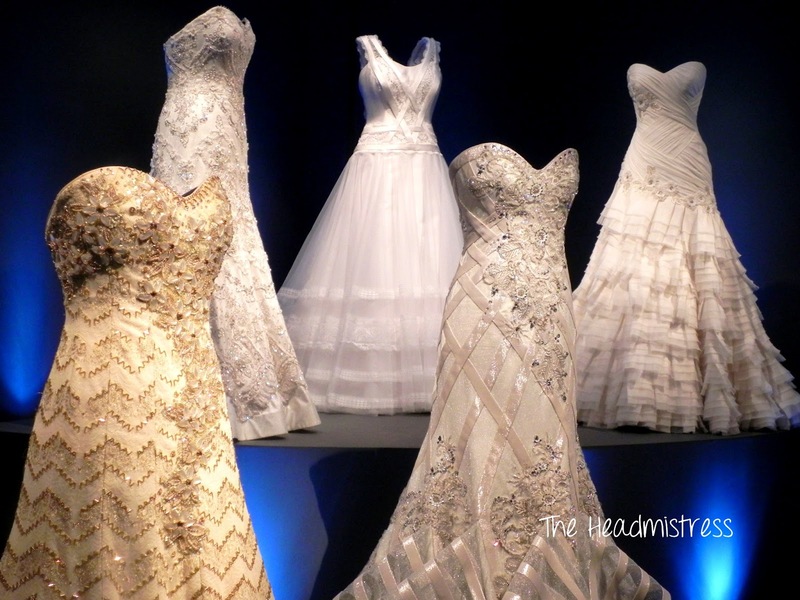 Each is a work of art, and one can only wonder as to the fortune paid for each one! 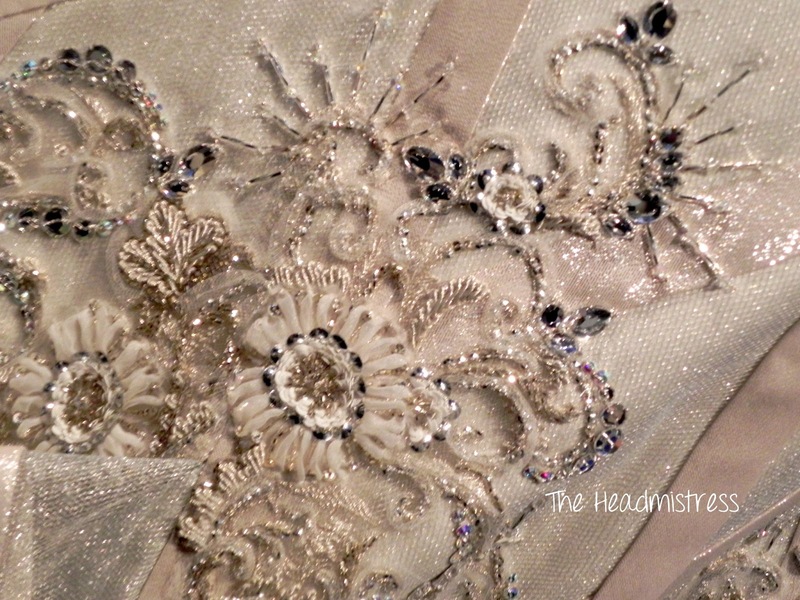 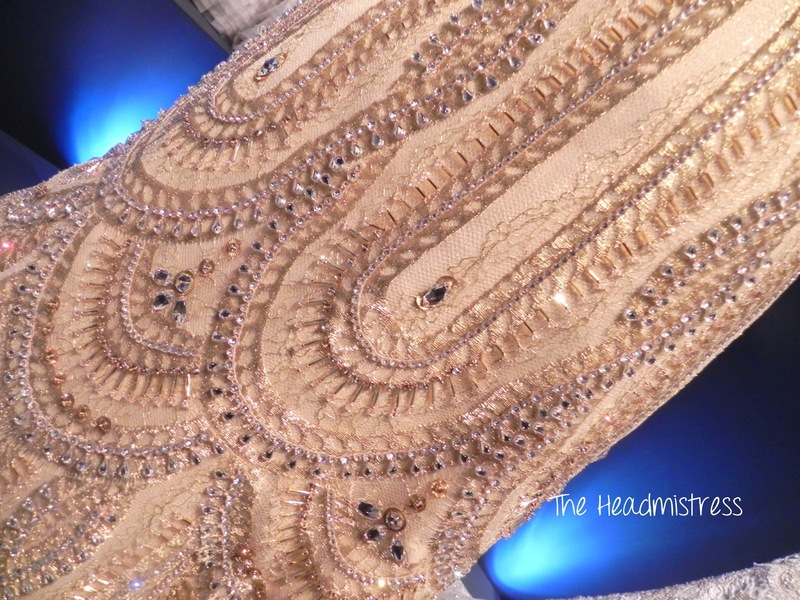 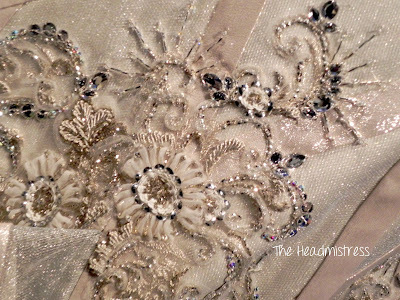 I hope those of you who appreciate dressmaking and artistry (and queens, princesses and brides) will enjoy these photos. 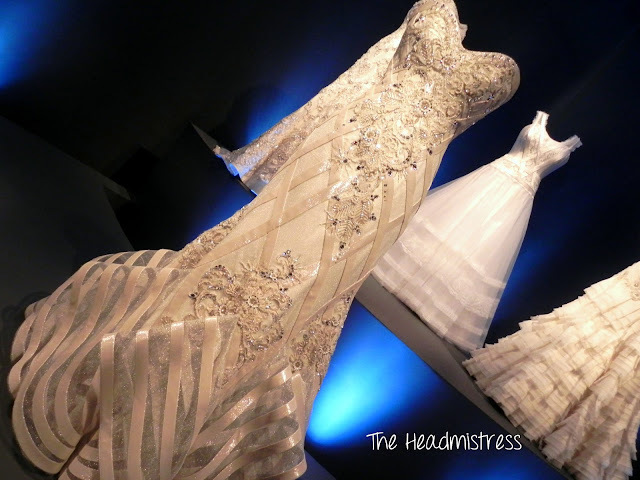 I took many, many more and it was difficult choosing which ones to include here! 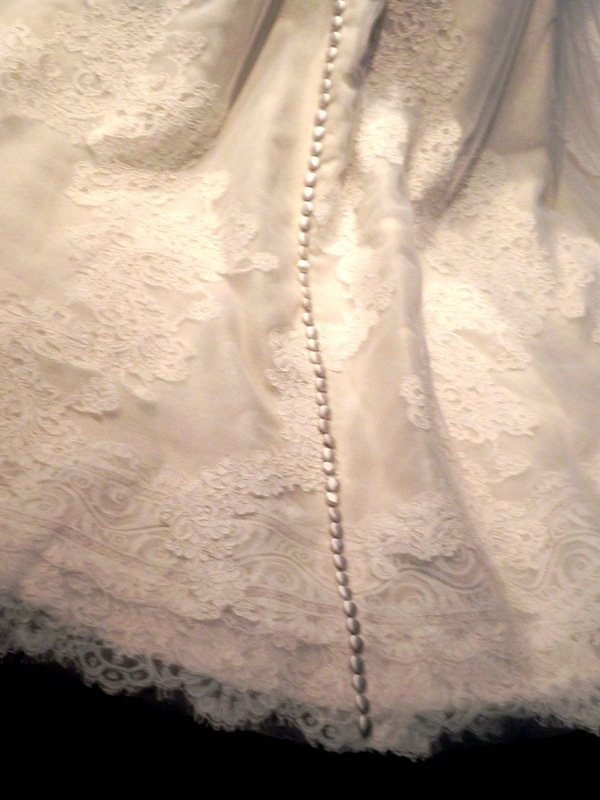 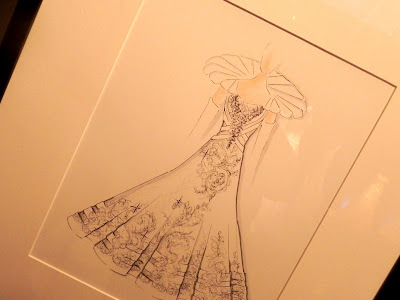 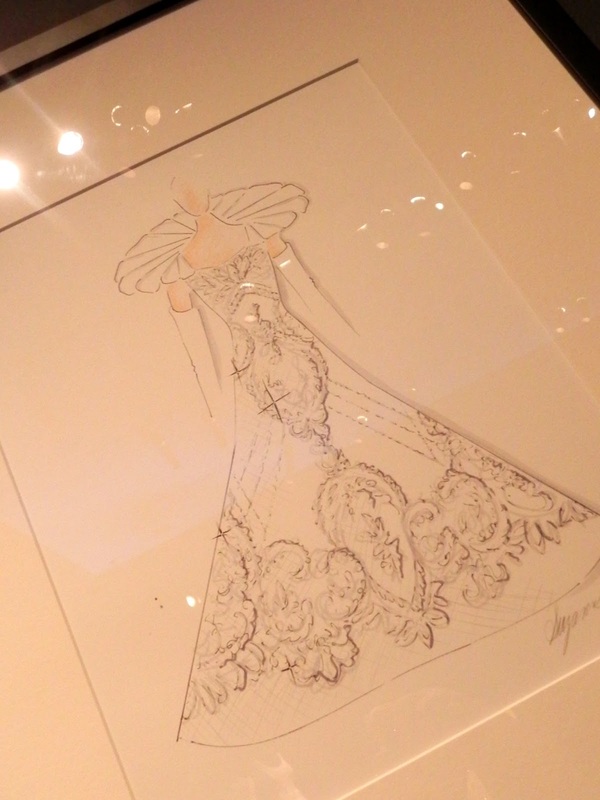 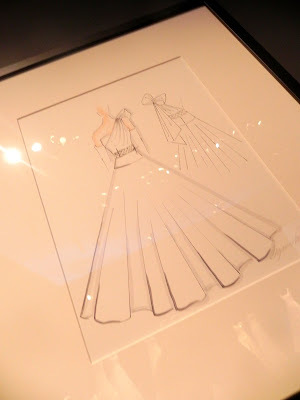 A future post will include the wedding gowns on display, as well as some of the actual sketches!